To comprehend the role of diet in the sustenance of life it’s essential for you all to think over body as a living machine which too requires some sort of means to carry out its normal functioning. But since the human body is one of the most complex machines hence instead of requiring one kind of means it requires multiple kinds so as to cater to the needs of its different organs. So when your mother asks you to eat a well balanced diet you seriously need to contemplate at it. The crucial role of food hence just can’t be denied in maintaining the health of an individual. But what if the very same concern for food assumes the shape of hang-up in the form of eating disorders! 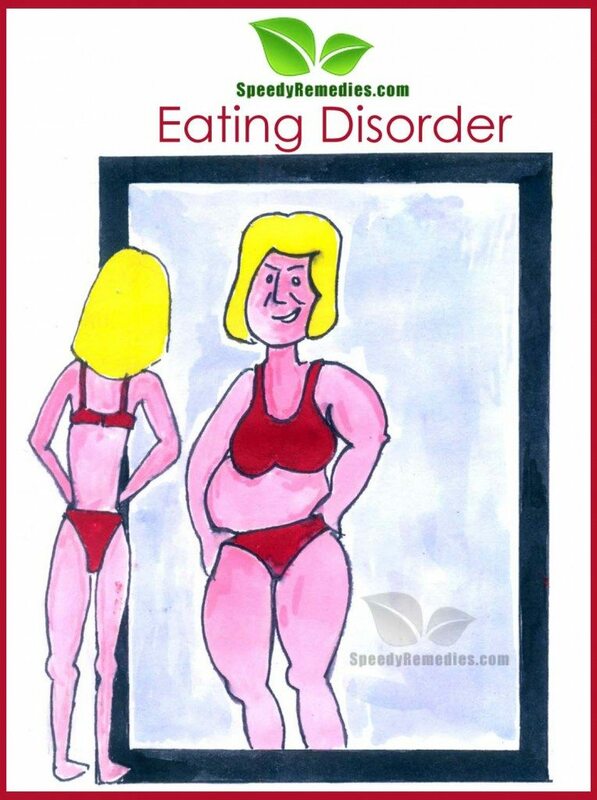 The literal meaning of eating disorders is an emotional disorder that manifests itself in an irrational craving for, or avoidance of, food, e.g. Buliminia. Thus it represent the two very undesirable bitter ends i.e. either eating too much in order to gain weight or too lesser to increase self respect. Although people initially tend to eat bit lesser or greater yet this tendency after some time becomes goes out of hand. Scientific research has attempted to figure out various causes of eating disorders varying from the biological to social ones but nevertheless the experts haven’t been unable to discover the exact cause of any kind for same. Basically there are two very undistinguished kinds of eating disorders i.e. anorexia nervosa and bulimia nervosa. Apart from these two there is also third kind of eating disorders which is called as eating disorders not otherwise specified i.e. (EDNOS) encompassing variety of the disorders. Binge-eating disorder which is drawing adequate R and D coupled with media concentration is nothing but a kind of EDNOS. Normally the disorders emerge either during pubescence or budding adolescence however it may grow up at any stage of life. One point to concentrate on is that the eating disorders are more prevalent in women as compared to men with the exclusion of binge-eating disorder which affects both the sexes equally. The eating disorders pass through every aspect of one’s life and thus have far-reaching impacts not only on the person suffering with it but on his family members as well. So read on further to know more about it including some valuable natural home remedies for eating disorders. More often eating disorders stem from low-lying self-esteem or as pessimistic course of action for managing life. Thus the causes of the disorders is the set of complex ones varying from the genetic to the socio cultural ones but still you need to know them as the cons of the eating disorders can also be death. So just read on to find more on them. Biological make-up of human body is considered to be one of the major causes of the disorders as the one with either parents or siblings suffering with it are more vulnerable to the eating disorders hinting towards the role of heredity in triggering it up. Besides it the amount of serotonin a brain chemical too is linked with eating disorders as it’s the one which have a bearing on the amount of food consumption and thus on the disorders. Cognitive and emotive health too is related to the occurrence of eating disorders as in majority of cases of eating disorders the patient is also found to suffer with low-lying self-esteem, faultfinding, spontaneous attitude, annoyance control difficulty, differences with family, strained relationships etc. Thus the people with any kind of psychological concerns attempt to take the charge of their lives by controlling their diet overlooking the importance of balanced diet! Socio cultural factors too give rise to various eating disorders as in some culture so called standard slimness is synonymous with beauty and thus motivate people to go for it in order to gain attention. Thus the much publicized figure is what set as benchmark by many who end up in developing various eating disorders. Another understanding which is hold responsible for the disorders is that in certain culture physical beauty is what emphasized on rather than inner one thereby inspiring many to cultivate eating disorders. • Specific Requirements Of Some Profession! We don’t mean that eating disorders is the requirement of any profession of whatsoever kind in this world but want to simply emphasize that certain professions by their nature demand slim or over sized ones. For instance ballerinas, gymnasts, runners and wrestlers etc are expected to limit/exceed their weight as per the kind of profession in which they are involved. The cover page of various fashion magazines are dominated by slim models/actresses who boast of their slimness. What’s more even the runways of different fashion icons showcase same. Even the electronic media is not far behind in impacting the diet pattern of an individual by showing various advertisements on ways to gain/reduce weight for becoming more beautiful. Apart from this we just can’t deny the dominance of Hollywood on all of our lives as don’t we all look up to different celebs of Hollywood for knowing what’s in “in” fashion world right now besides taking different hints from their weddings. And take a shot at the number of people who strive hard to look like them i.e. attempting to get the impracticable beauty which is only found in fantasies by unconsciously becoming slaves of various kinds of eating disorders. Gender too has got to do with eating disorders as the point to be focused on is that nearly all cases of disorders are females with males accounting for mere below 10%! The fact shouldn’t sound much surprising as every woman of the world wishes to have unmatched beauty and is always ready to do anything to get the diva like looks to get the attention. Thus denying oneself diet is not a big deal for them when it comes to do so for acquiring gorgeous looks i.e. running after beauty at the cost of health issues! o Excitable gobbling up when feeling annoyed, grieved, stirred etc. • As the major root cause of the eating disorders is the stress in different forms hence what can be the better remedy than the one which attacks the major causes of it i.e. stress. Thus to overcome stress and ultimately eating disorders you are well recommended to go for herbal tea which is one of the wonderful Ayurveda wonderful remedies. The most beneficial herbs which you can put to use include Chamomile, Echinacea, Comfrey and St. John’s Wort although others too can be put to good use preferably if mixed. • Charge up the taste of your food with different spices in case over eating disorder is troubling you as it’s not easy to over eat such food. To make the spicy food you can add cayenne pepper, cumin, chili and curry to food to limit otherwise over consumption of food. Well isn’t one of tasty natural home remedies for eating disorders! • Quiet time along with deep breathing also goes a long way in stress management process ultimately helping you to treat eating disorders naturally. • In case affected with anorexia you are well advised to shoot for various appetite excitants as by skipping meals very often you need to increase your appetite. Thus you can make a good use of caraway seeds, thyme, horseradish and angelica by consuming them in different forms varying from the natural state itself to their addition to salads and soups. Other herbs too can be utilized to treat disorders in the form of essential oils which can be massaged on the upper trunk region. Such herbs include myrrh, chamomile, yarrow and lavender. • Make a habit of taking breakfast daily as it’s essential for health thus after taking it you can even afford to skip some meal at later part of the day as your body’s needs will be provided by the nutritious breakfast itself. go for in such a case. • In case unable to contain your diet then it’s a better move to eat loads of fruits and vegetables as they are rich sources of various vitamins and minerals required by the body hence not as harmful as other kinds of foods’ overconsumption. In fact the entire issue of eating disorders is concerned with diet wherein some over eat while others even not eat to fulfill their body’s unique requirements in terms of nutrients and minerals. So the key is to avoid both the harmful ends and staying in the middle. • Abstain from the greasy and sugary foods altogether as they being tasty tends to motivate the consumer for more and more leading to the emergence of eating disorders. To refrain from them avoid storing them up in the refrigerator or at some other place so as to overpower your eating disorders. • In an attempt to curtail down the diet you are better encouraged not to give up the foods which you love as doing this will lead to more attraction towards them. Thus it would be better if you instead of giving up altogether reduce down the consumption initially to treat eating disorders gradually. Remember the difference between the nutritious and simply mouth watering foods for your body.